K-Laser® is a quick and painless therapeutic treatment, useful for a range of conditions, including soft tissue injuries and osteoarthritis. Using red and near-infrared class IV laser light, the K-Laser® improves circulation and therefore the supply of water, nutrients and oxygen to the damaged area, creating optimal conditions for healing. Treatment with the K-Laser® can help reduce inflammation, swelling, muscle spasm, stiffness and pain. No, K-Laser® isn’t painful and is well tolerated by most patients. Your pet will just feel a soothing warmth in the area being treated. However, the physiotherapist will carefully monitor your pet throughout treatment and stop if they are not tolerating it well. Definitely. Here at the Cromwell ARC, we strongly believe that a pet’s owner is an essential part of the rehabilitation team. 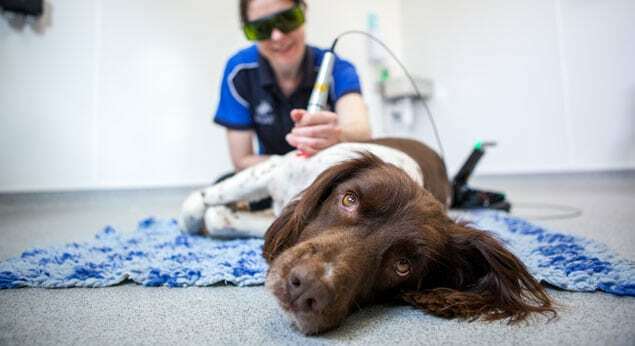 During a K-Laser® session, your pet will need to sit relatively still for a few minutes, which they often find easier if they are getting a big fuss from their favourite person! You will need to wear protective glasses for the duration of the treatment. Treatment times vary depending on how many areas need treating and the size of your pet; however K-Laser® can take as little as 10-15 minutes. How often will my pet have to come for treatment? Initially, we advise seeing your pet for K-Laser® therapy for six sessions during a three week interval. Following this initial treatment period, the frequency of appointments can be reduced, with some pets only needing treatment every 3-4 weeks and for those with acute conditions, stopping altogether. K-Laser® is a very safe therapy with no long term side effects. However, some pets may be a little stiff after their first K-Laser® session but this should quickly improve.